Poly(lactic acid) or polylactic acid or polylactide (PLA) is a biodegradable and bioactive thermoplastic aliphatic polyester derived from renewable biomass, typically from fermented plant starch such as from corn, cassava, sugarcane or sugar beet pulp. In 2010, PLA had the second highest consumption volume of any bioplastic of the world. Producers have several industrial routes to usable (i.e. high molecular weight) PLA. Two main monomers are used: lactic acid, and the cyclic di-ester, lactide. The most common route to PLA is the ring-opening polymerization of lactide with various metal catalysts (typically tin octoate) in solution, in the melt, or as a suspension. The metal-catalyzed reaction tends to cause racemization of the PLA, reducing its stereoregularity compared to the starting material (usually corn starch). Another route to PLA is the direct condensation of lactic acid monomers. This process needs to be carried out at less than 200 °C; above that temperature, the entropically favored lactide monomer is generated. This reaction generates one equivalent of water for every condensation (esterification) step. The condensation reaction is reversible and subject to equilibrium, so removal of water is required to generate high molecular weight species. Water removal by application of a vacuum or by azeotropic distillation is required to drive the reaction toward polycondensation. Molecular weights of 130 kDa can be obtained this way. Even higher molecular weights can be attained by carefully crystallizing the crude polymer from the melt. Carboxylic acid and alcohol end groups are thus concentrated in the amorphous region of the solid polymer, and so they can react. Molecular weights of 128–152 kDa are obtainable thus. Polymerization of a racemic mixture of L- and D-lactides usually leads to the synthesis of poly-DL-lactide (PDLLA), which is amorphous. Use of stereospecific catalysts can lead to heterotactic PLA which has been found to show crystallinity. The degree of crystallinity, and hence many important properties, is largely controlled by the ratio of D to L enantiomers used, and to a lesser extent on the type of catalyst used. 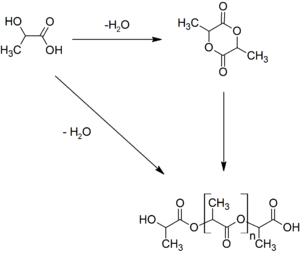 Apart from lactic acid and lactide, lactic acid O-carboxyanhydride ("lac-OCA"), a five-membered cyclic compound has been used academically as well. This compound is more reactive than lactide, because its polymerization is driven by the loss of one equivalent of carbon dioxide per equivalent of lactic acid. Water is not a co-product. The direct biosynthesis of PLA similar to the poly(hydroxyalkanoate)s has been reported as well. Another method devised is by contacting lactic acid with a zeolite. This condensation reaction is a one-step process, and runs about 100 °C lower in temperature. Due to the chiral nature of lactic acid, several distinct forms of polylactide exist: poly-L-lactide (PLLA) is the product resulting from polymerization of L,L-lactide (also known as L-lactide). PLA is soluble in solvents, hot benzene, tetrahydrofuran, and dioxane. PLA polymers range from amorphous glassy polymer to semi-crystalline and highly crystalline polymer with a glass transition of 60 °C and melting points of 130-180 °C. PLA has a glass transition temperature 60–65 °C, a melting temperature 173–178 °C and a tensile modulus 2.7–16 GPa. Heat-resistant PLA can withstand temperatures of 110 °C. The basic mechanical properties of PLA are between those of polystyrene and PET. The melting temperature of PLLA can be increased by 40–50 °C and its heat deflection temperature can be increased from approximately 60 °C to up to 190 °C by physically blending the polymer with PDLA (poly-D-lactide). PDLA and PLLA form a highly regular stereocomplex with increased crystallinity. The temperature stability is maximised when a 1:1 blend is used, but even at lower concentrations of 3–10% of PDLA, there is still a substantial improvement. In the later case, PDLA acts as a nucleating agent, thereby increasing the crystallization rate. Biodegradation of PDLA is slower than for PLA due to the higher crystallinity of PDLA. The flexural modulus of PLA is higher than polystyrene and PLA has good heat sealability. Several technologies such as annealing, adding nucleating agents, forming composites with fibers or nano-particles, chain extending and introducing crosslink structures have been used to enhance the mechanical properties of PLA polymers. Polylactic acid can be processed like most thermoplastics into fiber (for example, using conventional melt spinning processes) and film. PLA has similar mechanical properties to PETE polymer, but has a significantly lower maximum continuous use temperature. With high surface energy, PLA has easy printability which makes it widely used in 3-D printing. The tensile strength for 3-D printed PLA was previously determined. PLA can be solvent welded using dichloromethane. PLA is used as a feedstock material in desktop fused filament fabrication 3D printers (e.g. RepRap). PLA printed solids can be encased in plaster-like moulding materials, then burned out in a furnace, so that the resulting void can be filled with molten metal. This is known as "lost PLA casting", a type of investment casting. Being able to degrade into innocuous lactic acid, PLA is used as medical implants in the form of anchors, screws, plates, pins, rods, and as a mesh. Depending on the exact type used, it breaks down inside the body within 6 months to 2 years. This gradual degradation is desirable for a support structure, because it gradually transfers the load to the body (e.g. the bone) as that area heals. The strength characteristics of PLA and PLLA implants are well documented. PLA can also be used as a decomposable packaging material, either cast, injection-molded, or spun. Cups and bags have been made from this material. In the form of a film, it shrinks upon heating, allowing it to be used in shrink tunnels. It is useful for producing loose-fill packaging, compost bags, food packaging, and disposable tableware. In the form of fibers and nonwoven fabrics, PLA also has many potential uses, for example as upholstery, disposable garments, awnings, feminine hygiene products, and diapers. Thanks to its bio-compatibility and biodegradability, PLA has also found ample interest as a polymeric scaffold for drug delivery purposes. Racemic and regular PLLA has a low glass transition temperature, which is undesirable. A stereocomplex of PDLA and PLLA has a higher glass transition temperatures, lending it more mechanical strength. It has a wide range of applications, such as woven shirts (ironability), microwavable trays, hot-fill applications and even engineering plastics (in this case, the stereocomplex is blended with a rubber-like polymer such as ABS). Such blends also have good form stability and visual transparency, making them useful for low-end packaging applications. Pure poly-L-lactic acid (PLLA), on the other hand, is the main ingredient in Sculptra, a long-lasting facial volume enhancer, primarily used for lipoatrophy of cheeks. Progress in biotechnology has resulted in the development of commercial production of the D enantiomer form, something that was not possible until recently. PLA is also used in the e-tobacco industry. Philip Morris's iQOS heets include PLA to slow the vapour down without absorbing it, giving it time to cool to a more pleasant temperature before inhaling it. Mulch film made of PLA-blend "bio-flex"
Tea bags made of PLA. Peppermint tea is enclosed. 3D printing of a microcoil using a conductive mixture of polylactide and carbon nanotubes. 3D printed human skull with data from computed tomography. Transparent PLA. Amycolatopsis and Saccharothrix are able to degrade PLA. A purified protease from Amycolatopsis sp., PLA depolymerase, can also degrade PLA. Enzymes such as pronase and most effectively proteinase K from Tritirachium album degrade PLA. Pure PLA foams undergo selective hydrolysis when placed in an environment of Dulbecco's modified Eagle's medium (DMEM) supplemented with fetal bovine serum (FBS) (a solution mimicking body fluid). After 30 days of submersion in DMEM+FBS, a PLLA scaffold lost about 20% of its weight. PLA samples of varying molecular weight were degraded into methyl lactate (a green solvent) by using a metal complex catalyst. ^ a b "Matbase". Archived from the original on 10 February 2012. Retrieved 6 February 2012. ^ Ceresana. "Bioplastics - Study: Market, Analysis, Trends - Ceresana". www.ceresana.com. Archived from the original on 4 November 2017. Retrieved 9 May 2018. ^ Martin, O; Avérous, L (2001). "Poly(lactic acid): plasticization and properties of biodegradable multiphase systems". Polymer. 42 (14): 6209–6219. doi:10.1016/S0032-3861(01)00086-6. ^ a b Södergård, Anders; Mikael Stolt (2010). "3. Industrial Production of High Molecular Weight Poly(Lactic Acid)". In Rafael Auras; Loong-Tak Lim; Susan E. M. Selke; Hideto Tsuji (eds.). Poly(Lactic Acid): Synthesis, Structures, Properties, Processing, and Applications. pp. 27–41. doi:10.1002/9780470649848.ch3. ISBN 9780470649848. ^ Kricheldorf, Hans R.; Jonté, J. Michael (1983). "New polymer syntheses". Polymer Bulletin. 9 (6–7). doi:10.1007/BF00262719. ^ Jung, Yu Kyung; Kim, Tae Yong (2009). "Metabolic Engineering of Escherichia coli for the production of Polylactic Acid and Its Copolymers". Biotechnology and Bioengineering. 105 (1): 161–71. doi:10.1002/bit.22548. PMID 19937727. ^ Drury, Jim. "Cheaper, greener, route to bioplastic". reuters.com. Archived from the original on 1 December 2017. Retrieved 9 May 2018. ^ Dusselier, Michiel; Wouwe, Pieter Van; Dewaele, Annelies; Jacobs, Pierre A.; Sels, Bert F. (3 July 2015). "Shape-selective zeolite catalysis for bioplastics production". Science. 349 (6243): 78–80. Bibcode:2015Sci...349...78D. doi:10.1126/science.aaa7169. PMID 26138977. Archived from the original on 24 September 2017. Retrieved 9 May 2018 – via science.sciencemag.org. ^ Garlotta, Donald (2001). "A Literature Review of Poly(Lactic Acid)". Journal of Polymers and the Environment. 9 (2): 63–84. doi:10.1023/A:1020200822435. Archived from the original on 26 May 2013. ^ a b Lunt, James (3 January 1998). "Large-scale production, properties and commercial applications of polylactic acid polymers". Polymer Degradation and Stability. 59 (1–3): 145–152. doi:10.1016/S0141-3910(97)00148-1. ISSN 0141-3910. ^ Södergård, Anders; Mikael Stolt (February 2002). "Properties of lactic acid based polymers and their correlation with composition". Progress in Polymer Science. 27 (6): 1123–1163. doi:10.1016/S0079-6700(02)00012-6. ^ Middelton, John C.; Arthur J. Tipton (2000). "Synthetic biodegradable polymers as orthopedic devices". Biomaterial. 21 (23): 2335–2346. doi:10.1016/S0142-9612(00)00101-0. ^ Gina L. Fiore; Feng Jing; Victor G. Young Jr.; Christopher J. Cramer; Marc A. Hillmyer (2010). "High Tg Aliphatic Polyesters by the Polymerization of Spirolactide Derivatives". Polymer Chemistry. 1 (6): 870–877. doi:10.1039/C0PY00029A. ^ Nugroho, Pramono; Mitomo, Hiroshi; Yoshii, Fumio; Kume, Tamikazu (1 May 2001). "Degradation of poly(l-lactic acid) by γ-irradiation". Polymer Degradation and Stability. 72 (2): 337–343. doi:10.1016/S0141-3910(01)00030-1. ISSN 0141-3910. ^ Urayama, Hiroshi; Kanamori, Takeshi; Fukushima, Kazuki; Kimura, Yoshiharu (1 September 2003). "Controlled crystal nucleation in the melt-crystallization of poly(l-lactide) and poly(l-lactide)/poly(d-lactide) stereocomplex". Polymer. 44 (19): 5635–5641. doi:10.1016/S0032-3861(03)00583-4. ISSN 0032-3861. ^ Tsuji, H. (1 January 1995). "Properties and morphologies of poly(l-lactide): 1. Annealing condition effects on properties and morphologies of poly(l-lactide)". Polymer. 36 (14): 2709–2716. doi:10.1016/0032-3861(95)93647-5. ISSN 0032-3861. ^ Urayama, Hiroshi; Ma, Chenghuan; Kimura, Yoshiharu (July 2003). "Mechanical and Thermal Properties of Poly(L-lactide) Incorporating Various Inorganic Fillers with Particle and Whisker Shapes". Macromolecular Materials and Engineering. 288 (7): 562–568. doi:10.1002/mame.200350004. ISSN 1438-7492. ^ Trimaille, T.; Pichot, C.; Elaïssari, A.; Fessi, H.; Briançon, S.; Delair, T. (1 November 2003). "Poly(d,l-lactic acid) nanoparticle preparation and colloidal characterization". Colloid and Polymer Science. 281 (12): 1184–1190. doi:10.1007/s00396-003-0894-1. ISSN 0303-402X. ^ Hu, Xiao; Xu, Hong-Sheng; Li, Zhong-Ming (4 May 2007). "Morphology and Properties of Poly(L-Lactide) (PLLA) Filled with Hollow Glass Beads". Macromolecular Materials and Engineering. 292 (5): 646–654. doi:10.1002/mame.200600504. ISSN 1438-7492. ^ Li, Bo-Hsin; Yang, Ming-Chien (2006). "Improvement of thermal and mechanical properties of poly(L-lactic acid) with 4,4-methylene diphenyl diisocyanate". Polymers for Advanced Technologies. 17 (6): 439–443. doi:10.1002/pat.731. ISSN 1042-7147. ^ Di, Yingwei; Iannace, Salvatore; Di Maio, Ernesto; Nicolais, Luigi (4 November 2005). "Reactively Modified Poly(lactic acid): Properties and Foam Processing". Macromolecular Materials and Engineering. 290 (11): 1083–1090. doi:10.1002/mame.200500115. ISSN 1438-7492. ^ "Compare Materials: PLA and PETE". Makeitfrom.com. Archived from the original on 1 May 2011. Retrieved 11 April 2011. ^ Giordano, R.A.; Wu, B.M. ; Borland, S.W. ; Cima, L.G. ; Sachs, E.M.; Cima, M.J. (1997). "Mechanical properties of dense polylactic acid structures fabricated by three dimensional printing". Journal of Biomaterials Science, Polymer Edition. 8 (1): 63–75. doi:10.1163/156856297x00588. ^ Lam, C. X. F.; Olkowski, R.; Swieszkowski, W.; Tan, K. C.; Gibson, I.; Hutmacher, D. W. (2008). "Mechanical and in vitro evaluations of composite PLDLLA/TCP scaffolds for bone engineering". Virtual and Physical Prototyping. 3 (4): 193–197. doi:10.1080/17452750802551298. ^ Bose, S.; Vahabzadeh, S.; Bandyopadhyay, A. (2013). "Bone tissue engineering using 3D printing". Materials Today. 16 (12): 496–504. doi:10.1016/j.mattod.2013.11.017. ^ Coysh, Adrian (12 April 2013). "Dichloromethane Vapor Treating PLA parts". Thingiverse.com. Archived from the original on 1 December 2017. Retrieved 9 May 2018. ^ "PLA". Reprap Wiki. 4 April 2011. Archived from the original on 16 July 2011. Retrieved 11 April 2011. ^ "PLA". MakerBot Industries. Archived from the original on 23 April 2011. Retrieved 11 April 2011. ^ "Metal Casting with Your 3D Printer | Make:". Make: DIY Projects and Ideas for Makers. Retrieved 30 November 2018. ^ a b Rafael Auras; Loong-Tak Lim; Susan E. M. Selke; Hideto Tsuji, eds. (2010). Poly(Lactic Acid): Synthesis, Structures, Properties, Processing, and Applications. doi:10.1002/9780470649848. ISBN 9780470293669. ^ Nazre, A.; Lin, S. (1994). Harvey, J. Paul; Games, Robert F. (eds.). Theoretical Strength Comparison of Bioabsorbable (PLLA) Plates and Conventional Stainless Steel and Titanium Plates Used in Internal Fracture Fixation. p. 53. ISBN 978-0-8031-1897-3. ^ "Bioengineers succeed in producing plastic without the use of fossil fuels". Physorg.com. Archived from the original on 6 June 2011. Retrieved 11 April 2011. ^ Guo, Shuang-Zhuang; Yang, Xuelu; Heuzey, Marie-Claude; Therriault, Daniel (2015). "3D printing of a multifunctional nanocomposite helical liquid sensor". Nanoscale. 7 (15): 6451–6. Bibcode:2015Nanos...7.6451G. doi:10.1039/C5NR00278H. PMID 25793923. ^ Pavia FC; La Carrubba V; Piccarolo S; Brucato V (August 2008). "Polymeric scaffolds prepared via thermally induced phase separation: tuning of structure and morphology". Journal of Biomedical Materials Research Part A. 86 (2): 459–466. doi:10.1002/jbm.a.31621. PMID 17975822. ^ Román-Ramírez, Luis A.; Mckeown, Paul; Jones, Matthew D.; Wood, Joseph (4 January 2019). "Poly(lactic acid) Degradation into Methyl Lactate Catalyzed by a Well-Defined Zn(II) Complex". ACS Catalysis. 9 (1): 409–416. doi:10.1021/acscatal.8b04863. Wikimedia Commons has media related to Polylactides.